1st Combat Jump Bronze Star shown. Second, Third, Fourth Bronze Star available. Your photocopy must be mailed or emailed address below. The Parachutist Badge was formally approved on 10 March 1941. The senior and master Parachutists badges were authorized by Headquarters, Department of the Army in 1949 and were announced by Change 4, Army Regulation 600-70, dated 24 January 1950. Description: An oxidized silver badge 1 13/64 inches in height and 1 1/2 inches in width, consisting of an open parachute on and over a pair of stylized wings displayed and curving inward. A star and wreath are added above the parachute canopy to indicate the degree of qualification. A star above the canopy indicates a Senior Parachutist; the star surrounded by a laurel wreath indicates a Master Parachutist. Symbolism: The wings suggest flight and, together with the open parachute, symbolize individual proficiency and parachute qualifications. Basic Parachutist: Awarded to any individual who has satisfactorily completed the prescribed proficiency tests while assigned or attached to an airborne unit or the Airborne Department of the Infantry School; or participated in at least one combat parachute jump. 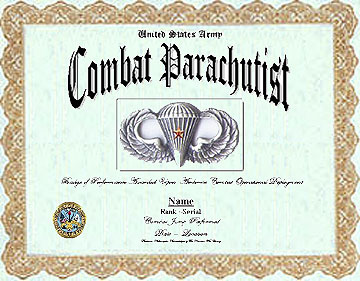 Senior Parachutist: Participated in a minimum of 30 jumps to include 15 jumps with combat equipment; two night jumps, one of which is as jumpmaster of a stick; two mass tactical jumps which culminate in an airborne assault problem; graduated from the Jumpmaster Course; and served on jump status with an airborne unit or other organization authorized Parachutists for a total of at least 24 months. Master Parachutist: Participated in 65 jumps to include 25 jumps with combat equipment; four night jumps, one of which is as a jumpmaster of a stick; five mass tactical jumps which culminate in an airborne assault problem with a unit equivalent to a battalion or larger; separate company/battery or organic staff of a regiment size or larger; graduated from the Jumpmaster Course; and served in jump status with an airborne unit or other organization authorized Parachutists for a total of at least 36 months. COMBAT PARACHUTIST BADGES: Stars representing participation in Parachutists had been worn unofficially on parachute wings during and after World War II. This practice did not gain official sanction until after the 1983 invasion of Grenada, Operation Urgent Fury. 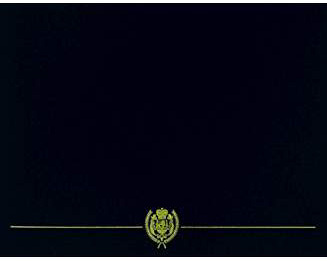 SUBDUED BADGES: Subdued badges are authorized in metal and cloth. The metal badge is black. The cloth badge is of olive green base cloth with the wings, parachute, star and wreath embroidered in black. MINIATURE BADGES: Dress miniature badges are authorized in the following sizes: Master - 13/16 inch in height and 7/8 inch in width; Senior - 5/8 inch in height and 7/8 inch in width; Parachutist - 15/32 inch in height and 7/8 inch in width.